A man, suspected to be jobless, who jumped into the Lagos lagoon at the Third Mainland Bridge yesterday, died shortly after being rescued. Attempts by paramedics to resuscitate him, after he was pulled out of the lagoon in Ebute Ero, Lagos, failed. It was learnt that passersby saw him walking towards Lagos Island on Ebute Ero bridge. He jumped into the lagoon a few minutes later. The passersby were said to have raised the alarm, which attracted fishermen. They dived into the water after him, while others contacted emergency workers. He was said to have been rescued unconscious about an hour later, but efforts to resuscitate him failed. 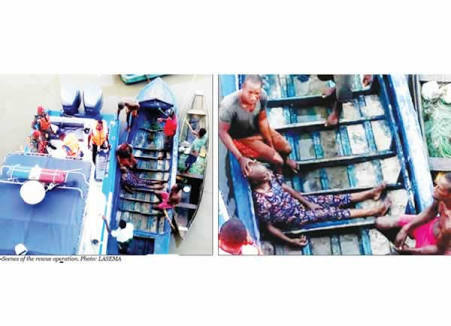 A source said officials of the Lagos State Waterways Authority (LASWA) arrived in their boats and took the man to where the paramedics’ ambulance was parked. “The incident occurred in the morning. People said they saw the man walking on the bridge towards the Island. He suddenly jumped into the lagoon. We were informed and fishermen dived into the water to rescue him. “He was rescued unconscious. He must have drunk a lot of water. LASWA officials came in their boat and took him away. We later heard that he has died,” the source added. The body has been handed over to the State Environmental Health Monitoring Unit (SEHMU).